Tennessee Crab Orchard Full Range Color Walkway & Patio Stone - Vertical Pallet. The striking colors of Tennessee Crab Orchard Full Range Color combine with the beauty of irregular stone to create a very unique walkway and patio stone. Hard to describe, can vary significantly within a pallet and from pallet to pallet. Quite often the base color is Salmon with color accents that can include Pink, Red, White, Rust and Brown. This is natural stone that is not processed in any way. The surface can range from smooth to rough. 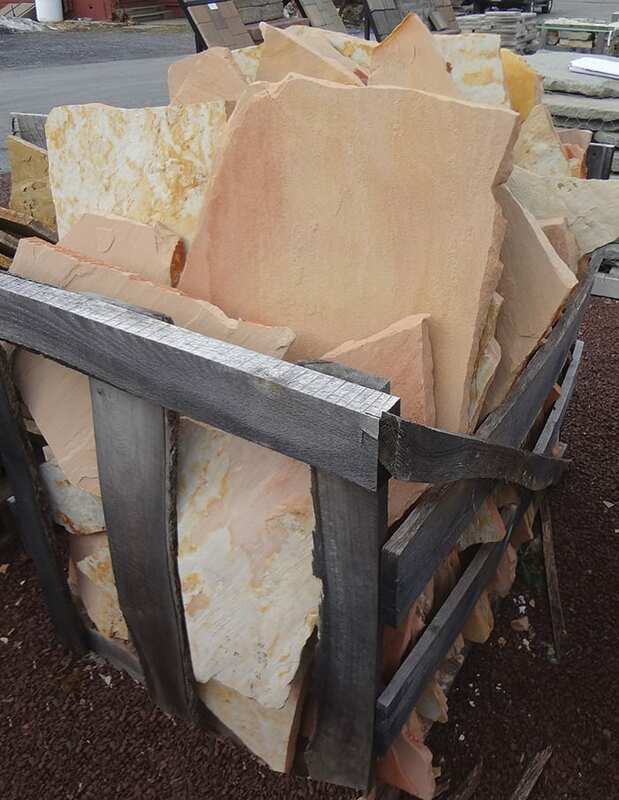 Tennessee Crab Orchard Full Range Color is a uniquely colorful stone. 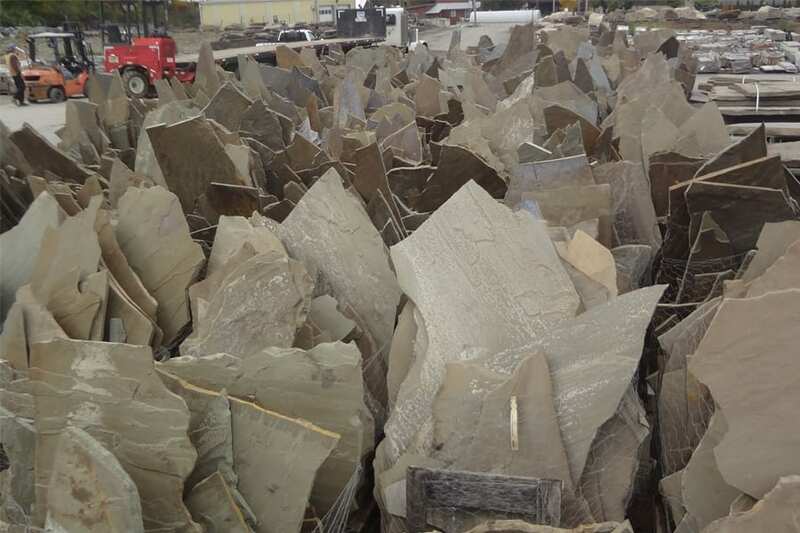 Not only can the stone vary widely in color within a pallet, it can vary significantly from pallet to pallet. Strikingly beautiful stone that often shows shades of Salmon, Pink or even Orange as a base color with a variety of accent colors possible. This is large stone and cannot be handled by one person. Do I have to buy a whole pallet? We strongly prefer that you buy a whole pallet. We do not allow customers to open new pallets and then mix and match pieces (for size or color) from more than one open pallet. Are vertical pallets like this made up of larger pieces than the horizontal pallets? Yes, these are large pieces - some pieces can be 5-6 feet tall and up to 36"+ wide. 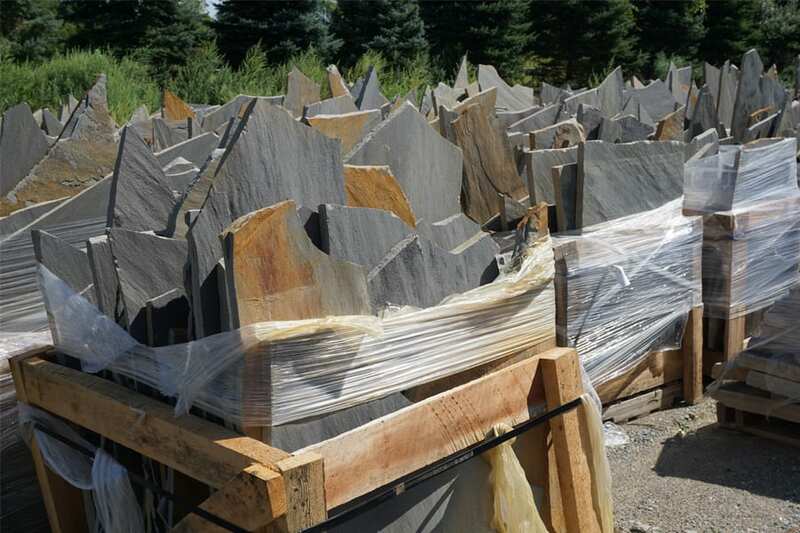 Horizontal pallets of irregular stone have smaller pieces. How much stone do I need to build my patio? Wicki Stone carries these products that match or compliment Rainbow Full Range Color Irregular walkway and patio stone. We sell over 1,500 different products in our yard, and we are constantly introducing new products. We can't show everything we sell on this site so please call if you have any questions or don't see what you are looking for. Or email us below.